I wrote in an earlier post about a study suggesting that topical ketoconazole increases hair growth in mice through an unknown mechanism. As interesting as rodent studies can be, the truth is that nothing beats experiments done on humans. That’s especially true of hair growth studies. Luckily, I found an old paper by Piérard-Franchimont et al. who compared the effects of topical ketoconazole to ordinary shampoos and minoxidil on people suffering from hair loss. Ketoconazole is the active ingredient in Nizoral, which is available as 1% and 2% strength. The latter was the one used in the study. Since the study included two separate experiments, I’m going to concentrate on the first one in this post and discuss the second one later. In the first experiment, 39 men between 21 and 33 years with androgenic alopecia (AGA) on the crown of the head. The duration of hair loss ranged from 2 to 6 years. However, none of them reported having had dandruff or seborrheic dermatitis in the last six months, which means that they probably just had good old male pattern baldness. The study included four groups: AGA + ketoconazole group, AGA + normal shampoo group, control + ketoconazole group, and control + normal shampoo group. Participants in the first two groups were the ones suffering from hair loss, while everyone in the two control groups had full heads of hair. The ketoconazole groups washed their hair with Nizoral shampoo 2-4 times per week for 21 months. The authors had their own somewhat novel method of measuring the results. First, the proportion of vertex hairs in anagen (growth) phase was measured. Then the average diameter of hairs 1.5 cm from the bulb was measured. Finally, to give an overall score, the anagen percentage was multiplied by the average diameter. This score, titled Pilary Index (PI) by the authors, was measured every three months. The graph below shows the PI of the two AGA groups. The black squares represent the participants with hair loss using Nizoral, and the white squares represent participants with hair loss using normal shampoo. The N and the arrow next to it refers to the PI values of the participants with no hair loss. The PI score of the AGA + normal shampoo group declined steadily throughout the study. In other words, they kept losing their hair. On the other hand, the AGA + ketoconazole group increased their PI score, meaning that their anagen percentage and/or hair thickness improved. The effect was evident after 6 months and seemed to plateau after 15 months. Ketoconazole also seemed to decrease sebum levels in the AGA group, with a median reduction of 18% at the end of the study. Compared to the AGA + normal shampoo group, the AGA + ketoconazole did considerably better. Even though the most drastic improvement was seen between months 6-15, the trendline was still up at the end of the study. And in fact, since a slight decrease was also seen between months 3-6, after which things picked up again, it may well be that Nizoral would have increased hair growth even further after the 21st month. As good as the results were, the PI scores of the AGA + ketoconazole group were still far behind those of the control group. Unfortunately, the paper doesn’t say whether ketoconazole affected hair growth in participants without hair loss. In men with hair loss, using 2% Nizoral shampoo 2-4 per week significantly improved measures of vertex hairs in anagen phase and hair diameter during the course of a 21-month study. At 15 months, the increase in the hair growth score was close to 50%. A slight decrease in hair growth scores was seen in those using normal shampoo. In the previous post, I wrote about a study on the effects of ketoconazole on hair growth in men with vertex hair loss. I mentioned that the same paper also describes another experiment comparing the hair growth effects of ketoconazole and minoxidil, which is what we’ll look at in this post. The second experiment had two groups with four men, age 24-29, in each. All of the men suffered from grade III hair loss of the vertex (the crown of the head). The first group used 2% Nizoral shampoo, while the second group used 2% minoxidil together with a normal shampoo. There was no significant difference between the groups in hair shaft diameter and sebaceous gland area. Interestingly, however, the authors found a negative linear relationship between hair shaft diameter and the area of the corresponding sebaceous glands. In other words, the larger the glands that secrete sebum in the hair follicles, the thinner the hair. After 6 months of using the treatments, the hair density of the Nizoral group went from 250 to 296 hairs per square centimeter; an increase of of 18%. In the minoxidil group, the increase was 11%, from 276 to 306 hairs. Both ketoconazole and minoxidil increased hair shaft diameter by 7%. Even though the sample size in this second experiment was very small, this looks like a very promising result. The mean sebaceous gland area of the Nizoral group decreased by 19.4%. However, in the minoxidil group, the area increased by 5.3%. This means that even though both ketoconazole and minoxidil stimulated hair growth, they did it through different mechanisms. Still, even at the end of the study, the negative relationship between gland area and hair shaft diameter remained. Ketoconazole, the active ingredient in Nizoral (and some other) shampoos, was more effective than minoxidil in increasing hair count in men with vertex hair loss after 6 months. 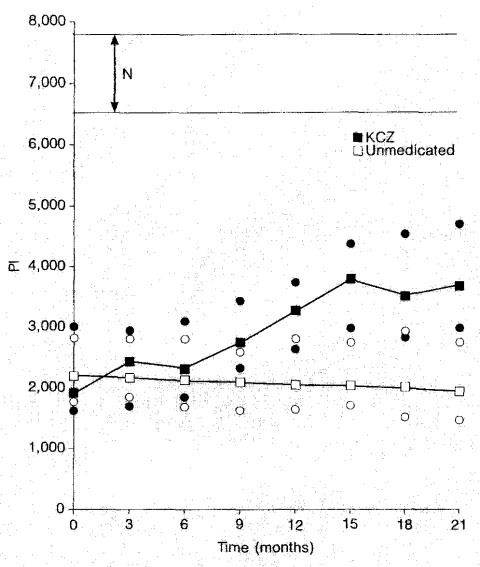 The increase in hair shaft diameter was the same with both ketoconazole and minoxidil. The two products appear to work through different mechanisms, as ketoconazole decreased sebum production while minoxidil increased it.